This is just a short – but special – post today. It’s my hubbands birthday and I have wanted to play with these plates for a special something just for him. When I got these plates it was the first thing I thought of so I kept it just for today! 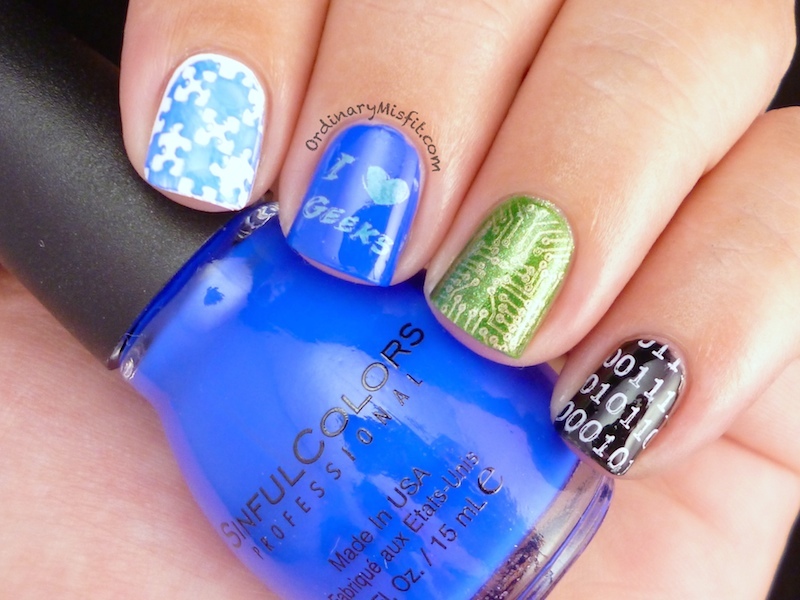 On my index and thumb I have 2 coats of Sinful Colors – Snow me white and stamped with BM319 and Sinful Colors – Endless Blue. I chose the images because my hubband is my favourite geek in the whole world so of course “I <3 Geeks” . He spends a large portion of his time around computers and code and stuff I have no idea about so I also knew the binary code and the ‘board’ would be right up his alley. And then lastly, the puzzle. He is the puzzle piece that make my whole picture complete. Without him there wouldn’t be a beautiful image but instead a partial image with a hole in it. I love you babe, I hope you have you a fabulous day and that we spend many many more together……. This is so sweet! Love it 🙂 Happy birthday to your husband! Hope you guys have a great day! AW! How sweet! Hope you had a great time celebrating! Happy birthday to your husband, wish him health and prosperity! Happy birthday to W! Great mani!